3D Skype chat on the way soon? 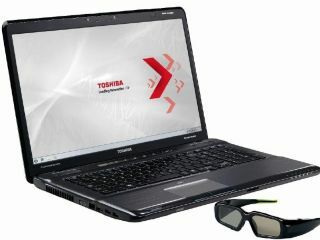 Toshiba has unveiled its latest 3D-toting laptops, the Toshiba P770 and P775, both of which pack in 3D webcams, and the Satellite L-Series with 3D playback capabilities. Does the inclusion of 3D webcams speak of 3D Skype video chats to come? It's a scary but unsurprising prospect. Skype does not yet support 3D webcams, but TechRadar has put a call in to Skype today, following Toshiba's latest laptop announcements, to find out how soon we might expect to see such a feature supported on the popular VoIP service. Meanwhile, the 3D tech in the new Toshiba L and P series laptops is pretty standard stuff, with pricing expected to be announced soon. Toshiba's all new Satellite P-series laptops are top of the range affairs, available intwo screen sizes: the Satellite P755 and P759 are 15.6-inch laptops, while the Satellite P770 and Satellite P775, feature slightly larger 17.3-inch screens. As well as the P-Series laptops, Toshiba has unveiled its new Satellite L-series notebooks today. These feature 2D-to-3D image conversion and external 3D playback, with integrated Onkyo speakers to "deliver immersive sound to match stunning visuals". "Available in a choice of three screen sizes and a range of configurations, each model features impressive hardware specifications, including the latest Intel or AMD processors, dedicated Nvidia graphics on selected models, as well as a selection of premium 3D features," continues Tosh's release. Toshiba will let us know more about UK pricing for the new Satellite L-series and P-series, both of which will be available from late April 2011.